Our group consists of FEZ Berlin employees aged between 16 and 27. Some of us are volunteers, others are trainees or interns. 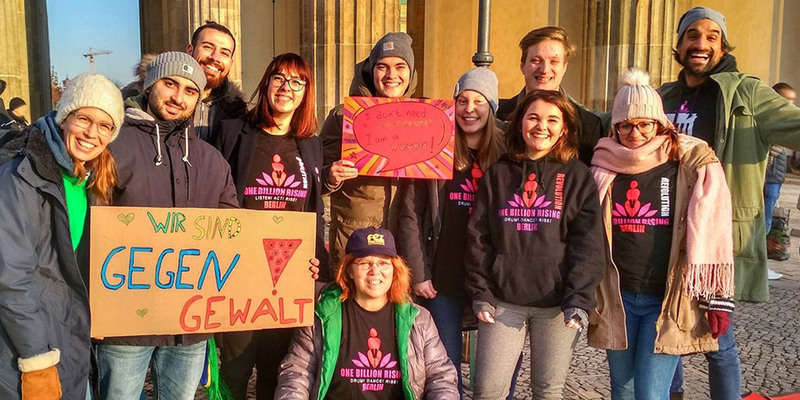 Together, we plan events such as the Christmas party for FEZ employees, we represent the FEZ Berlin at the YOU fair and we support proects like One Billion Rising. The FEZ Berlin gives us the freedom to incorporate our own ideas and develop projects that interest us. We meet regularly to discuss our work, plan our projects and support each other. Maybe you are interested in joining us? Do you want to be part of Youth@FEZ? You can get involved in the work of the FEZ, enjoy a year of unique experiences and see what working life is like. In the various departments of the FEZ, you'll become part of the team, can try new things, develop yourself and see what is right for your future. with Demokratie & Dialog e.V. You have a lot of interests and want to try out a few things before you make some important decisions for the future? Then why not apply for an internship at the FEZ? In the various departments, you'll learn about a typical working day and collect many practical and unique experiences. For our events on weekends and in the holidays, we are looking for dedicated people, who enjoy working with children and families and can employ their own talents and interests in doing so. Everyone who has already found a college and course that suits them and is looking for a suitable company, can apply with us. With the FEZ, you have the opportunity to work with and for children, to learn new things and experience a typical working day. You are interested in the FEZ's work and would like to apply? You can apply for the Federal Volunteer Service, internships, work placements and casual work in the personnel office at the FEZ or directly to the department of your choice.